According to numerous sources, George Lucas was inspired by the classic 1958 Japanese film, The Hidden Fortress. Much of the structure of A New Hope, including two comedic characters helping a kidnapped princess, a ruthless general, sword fights, and a seemingly unstoppable fortress were all translated into science fiction terms. Even the screen wipes were taken from Fortress. 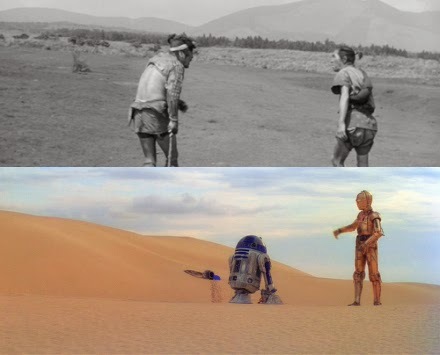 This mashup is a good way to quickly review how elements and even camera angles were adapted in Star Wars. It was edited by Eugene Baldovino for a class at the Academy of Art University in 1997. Too bad he didn't have such inspiration for the prequels. From Akira Kurosawa. A lot of later filmmakers owe him a debt. It would certainly be interesting to see Hidden Fortress itself remade. Not much of a Sci-Fi fan. Haven't seen Hidden Fortress. Now I want to see The Hidden Fortress. It's funny, because I watch a lot of those old movies and I'll say so and so definitely watched this and it inspired X. This is very interesting. I'd like to see both films. Every comment you ever have written is SPAM! Every comment you ever have written is SPAM! !